Take milk and sugar in a pan and bring it to a boil. Cook for about 10 minutes while stirring continuously. Then reduce heat, add saffron and milkmaid and stir. Continue cooking in low flame. Meanwhile make the balls. For this take milk powder, maida, baking powder and egg in a bowl and knead to make a soft dough. The dough will be sticky. Add ghee and knead again. You will get a smooth dough just like a jamun dough. Make small flat balls (about 18) and Keep ready. Check the taste of the milk-sugar mix and add sugar if necessary. Increase the heat and put the balls into the boiling milk. Remove from heat, and allow it to cool. Transfer to bowls, garnish with sliced pistachios and saffron, refrigerate and serve cold. 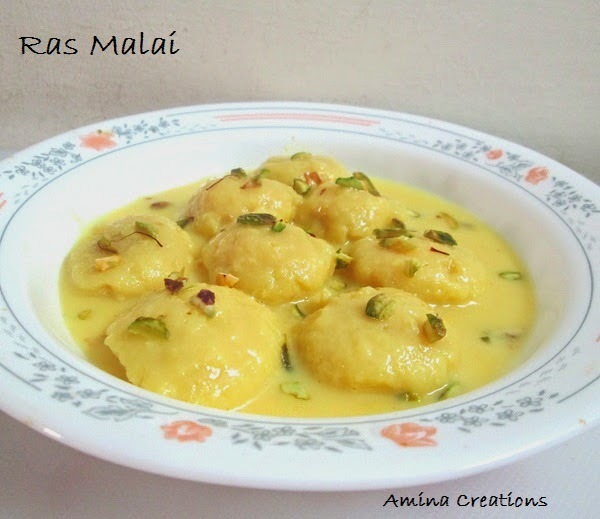 Simply awesome and delicious looking rasmali. Drooling over here.